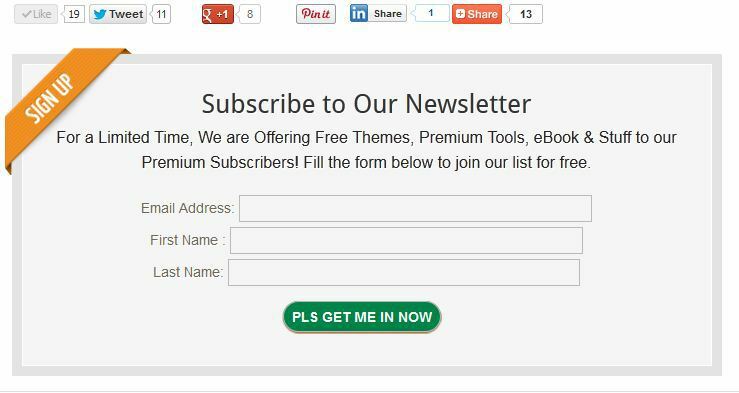 Adding mailchimp subscription opt-in form to after post content in genesis and wordpress blog in general without using a plugin has been a question in my mind so as every other blogger who has idea on how modern internet marketing works. I was like wow these are really decent options for me. Finally i decided to go with mailchimp.com since they are offering free account for 2,000 subscribers or less which has made it one of the most used company among the list above . Email Address: <input value="" size="50" id="MERGE1" name="MERGE0" type="text"
First Name : <input name="MERGE2" id="MERGE2" size="50" value="" type="text"
Last Name: <input name="MERGE3" id="MERGE3" size="50" value="" type="text"
you can change size=”50″ to 25 , 30 or any choosing size of your choice , same for color codes text and other default items contained in this tutorial . Obasi, thanks for this great post. I have been thinking of how to automatically add a mailchimp subscription form to my posts. I have actually been doing it manually. However, at the moment, I would rather have someone handle it for me than play with my files because am not yet grounded in that area of changing or modifying the codes in my functions file. Thanks all the same. It’s such a nice post. You have said it all. Nice tutorials for newbies and well illustrated with simple english. But my honest opinion is that Mailchimp are kinda wicked or strict with their services. They will just decide to ban accounts for no reason without notification. I think that is cruel act. I prefare listwire anyway. This post is so explanatory. And the option of mail chimp is nice. But, What if I don’t want to touch the style how will the form look like and, can I use the first code for other mailing list provider? Wow!very helpful post.you are a genius buddy. Thanks for sharing this information with us, I will try it . Indded a very good article !! Thinking to add mailchimp opt in form on my genesis blog using your tutorial. Would be awesome if you could elaborate. Kinda need the help. You’ll need extract the only the contents of the [form action=”” , u=”” and id=””] values from the code you’ve copied and substitute same in the code snippet given in this tutorial. Thanks for that. But i need a bit more help. I have saved the file (click on file ==> save ==> save it as => newsletter.php) . Post this, there are no instructions given for blogger users . Instructions for WordPress user are there. Please let me know the last few steps where i got to insert/upload the newletter.php file to. What theme are you trying to implement this on? Blogger? That’s right, i am working on Blogger. for blogger, you’d need to follow after the guide here. Next ItemHow to add mailchimp form to blogger, wordpress, Joomla & etc.